A blog that engages with aspects of British military aviation medicine in the late nineteenth and early twentieth centuries. I hope you had a wonderful weekend and that you are not completely snowed in! I have around 5 inches of snow outside my window right now and I am hoping that it will not hold back my research at the National Archives this week. This post serves a duel purpose. It publicizes a conference, of which I am a co-organiser, and also illuminates a fundamental institution that guided the practice and development of aviation medicine in the early twentieth century: the Royal Air Force Medical Service. I am a committee member of the Institute for Historical Research History Lab postgraduate group, based in London - the national network for postgraduate students in history. It is an intellectual and social forum designed to meet the needs of the postgrad community and to discuss ideas on how to drive history forward. History Lab runs a diverse series of events throughout the academic year, including research seminars, method workshops, and frequent socials. For more information, see: IHR History Lab On top of this, it also hosts an annual conference and this year's theme is 'Institutions'. Institutions have always been an integral part of human society and were traditionally understood as instruments of bureaucratic and social control and administration. However, recent events such as the Eurozone crisis have seen a collapse of trust in politics and the rise of activist movements such as Avaaz. These global changes have called into question the traditional definitions of institutions. ‘Institution’ also has a metaphorical meaning, from the ‘institution’ of marriage to a set of behaviours with very specific rules. What is an ‘institution’? Who makes ‘institutions’? How do they operate? What does the process of ‘institutionalisation’ entail? With these questions in mind, the History Lab Conference 2013 aims to investigate the relationships between institutions, societies and individuals through the analysis of historical example. Postgraduate students and early-career researchers are invited to submit proposals for papers (twenty minutes), or panels of three speakers, on specific topics exploring institutions or on wider relevant methodological and philosophical issues. Papers may cover any historical region or period, exploring institutions in topics including, but not limited to, the following areas. Social and community activism, protest and resistance. Medicine, medical institutions and treatment. The family, education and welfare. Labour, business and industrial relations. Policing, law and order, and incarceration. Some travel bursaries will be available for research students travelling from the United States. Please email: historylab2013@gmail.com for further details. To submit a proposal for the conference, please send your title along with a 250-word abstract, your institutional affiliation, and full contact details to: historylab2013@gmail.com by the deadline of Thursday 28th February, 2013. It is going to be a fantastic conference, so if you are a postgrad, please consider putting forward an abstract for consideration. The theme of institutions has got me thinking. Research into the history of aviation medicine is crucial, as without it, we wouldn't have achieved so many advances in aviation technology over the last century. Aviation medicine was particularly useful in military settings, as medical specialists contributed to the management of modern warfare by maintaining morale, combat efficiency, and discipline. The Royal Air Force Medical Services (RAFMS) attempted to meet these goals during the Second World War but to do so effectively, it had to have an excellent plan. How would the medical officers, specialists, and consultants respond to the broad range of casualties created by operational flying? By the Second World War, the British armed forces tended to apply medicine and medical knowledge to all aspects of military life. Harrison argued that this orientation was applied to conserve manpower and to maintain fighting strength. The use of general medicine declined and clinical medicine was superseded by a new focus on disease prevention. Each of the armed forces adopted these principles but applied them in very different ways. The Official History of the RAFMS showed that this service demonstrated their commitment to the dual-emphases of specialisation and prevention by introducing a broad range of specialists. From 1927, the Central Medical Establishment (a central body that aimed to examine and classify the medical fitness of air force personnel) employed specialists from eight elite branches of the medical profession in special reserve posts, each holding either Wing Commander or Group Captain rank in the areas of medicine (including tropical-medicine), neurology, surgery, bacteriology and parasitology, radiology (including electro-therapeutics), anaesthetics, ophthalmology, and otology. Prior to this, the RAFMS employed specialists to act as civilian consultants, as it was believed that they could rapidly reduce the rate of pensions paid to injured Great War veterans, which had caused an unforeseen financial burden. By 1932, the prestige of specialist appointments had increased with a number of special reserve posts being upgraded to consultant status, which demonstrated that the RAFMS considered specific skills to be particularly valuable. These included: oto-rhino-laryngology, applied physiology, neurology, medicine, and surgery. The consultants proved their value in the earlier pre-war period as they attended a large number of cases, with consultations exceeding 3000 in 1932 and over 6000 in 1935. It is clear that the consultants were essential in maintaining the health and combat efficiency of RAF personnel in peace time and would be even more indispensable at a time of war. I hope you have found this post interesting. I would love to hear your opinion on 'institutions'. As promised, I would bounce back with some interesting posts for you to read. 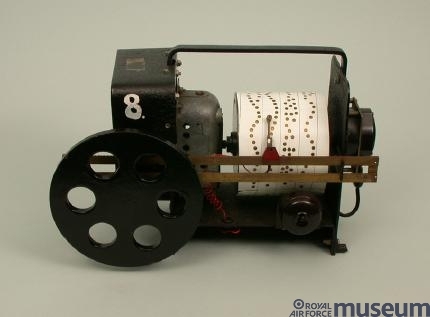 I thought I would showcase an instrument that I find particularly fascinating and will feature in my doctoral thesis. I hope you find this interesting and I would like to hear your points of view. The Reid Reaction Tester can be described as one of the earliest attempts at neuropsychiatric screening in the Royal Air Force. This device, introduced in the 1920s, helped to ascertain if potential flying candidates possessed the aptitude for piloting an aircraft. What is particularly interesting to me regarding the introduction of this machine was that neuropsychiatrists were not part of the medical service at this time but psychological theories were prevalent within the RAF and its medical service. Mental scientists and eugenicists had been researching the link between intelligence, coordination and performance from the nineteenth century, and the RAF was adopting a similar theory in their selection process. Some military historians may question why I believe that this is a medical device and not just a military selection tool. My answer to that is simple: it is testing the brain and mental capacity of the candidate. The Reid machine tested the co-ordination of the brain, hands and feet of potential aviators but why was this introduced? Training a pilot for service flying cost thousands of pounds and was very time-consuming. After the man had a successful interview, he was subject to a medical examination which ascertained physical fitness but apart from that, there was no way of knowing if the man would become a good pilot – if he possessed ‘the right stuff’. It was believed that by measuring his abilities before training, the Reid Reaction Tester would sort the wheat from the chaff, thus saving time, money, and lives. This very argument appeared again during the Second World War when RAF neuropsychiatrist Robert Gillespie attempted to reform the selection process using scientific methods. Popular periodical Flight Magazine stated that in 80% of cases, the apparatus indicated that the man would become a good pilot, and this was proven during training. As I learn more about this fascinating device, I will enlighten you further! I am interested in hearing your views or if you know anything more about this instrument. First of all, I would like to thank you for your patience with me. The sudden passing of my father has hit me like a ton of bricks and it is going to take me a long time to recover. I am currently hurtling down the West Coast Mainline at 120 mph, courtesy of Virgin Trains, and I thought I would share the details of a conference that I will be attending in a couple of months time. I am presenting at the British Psychological Society, History and Philosophy of Psychology Section Annual Conference, which is on the topic of 'DSM: The History, Theory, and Politics of Diagnosis'. This will be held at the University of Surrey, Guildford, between Monday 25th and Wednesday 27th of March. According to the section, 2013 marks the 40-year anniversary of the vote by the members of the American Psychiatric Association (commonly referred to as the APA) to remove 'homosexuality' from the Diagnostic and Statistical Manual (DSM) and the publication of a new volume. The conference not only marks this landmark event but also reflects upon the internal politics that shaped diagnoses, the classification of mental disorders, and the theories that underpinned the mental sciences in history. I am particularly excited about this conference, as it is my first external conference (outside of Oxford) and there is a chance for me to submit my paper for the Section's peer reviewed journal. The definition and classification of mental disorders was an issue of central importance to neuropsychiatrists working in the Royal Air Force (RAF) during the Second World War. These accomplished specialists believed that classifications should be specific, informed by rigorous research, and should reflect the image of an advancing scientific profession. This paper will examine a disorder, ‘flying stress’, which did not meet their exacting standards. It will critically assess the process by which this disorder was redefined and reclassified during the period 1941-2. The objections of neuropsychiatrists to the use of the term flying stress will be examined, including problems created by multiple medical definitions, similarities to other mental disorders, matters of professional standing, and non-adherence to official policy recommendations. The paper will show that the process of redefinition was defined by the concerns of RAF senior officers and intense inter-disciplinary research. Finally, it will consider the impact that the reclassification of mental disorders had on the practice of neuropsychiatry by examining post-removal terminology and the education of medical officers. This process also had a broader significance: neuropsychiatrists had effectively transformed categories of mental disorders, demonstrating that they held administrative control within their branch of the RAF Medical Service. I hope you find this abstract interesting and I also welcome a debate about the classification of mental disorders in the twentieth century, whether in military or civilian settings. I wish you all a belated Happy New Year. I will not be posting for a little while, as my father passed away peacefully a few days ago. I promise that when I return, I will have some interesting posts for you to enjoy. Until then, thanks for your understanding. This will be my last post of 2012, as I am signing off for the Christmas and New Year Period. I thought it would be appropriate to give you 'Lynsey's Annual Round-up' at this stage, for you to understand the progress I have made in my doctorate in 2012. I will completely understand if you view this as a self-indulgent pat on the back but I hope it will inspire new doctoral students to push ahead with their own research and to get the same enjoyment from the process. 2012 has been a very productive year for me. The year started with multiple trips to the National Archives, Kew, where I gathered an abundance of primary source material to enable me to start writing up. I write up my findings as I go along to ensure that my writing skills do not get rusty. I will, of course, revise, amend and add to this in my final year. I completed my transfer of status (often known as an upgrade), where I had to write up 5000 words of original research and present a conference paper. In extension to the latter, I co-organised the conference where this was presented, which was a massive success. I passed my transfer and I gained some very useful feedback from my examiners, Dr Sloan Mahone and Professor Pietro Corsi. The summer months saw me pretty much camped out in the London archives and libraries, and writing up from Oxford. I have completed my secondary reading (for now) and wrote up a draft introduction/literature review. This has to be revised, as it is sitting at 15,000 words and is all in the present tense. When I am doing my final drafts, I will put this into synopsis but contrary to what my fellow doctoral students think, this was not a waste of time. It has helped me to 'set out my stall' so to speak - I have refined my core research questions and I know who I agree and disagree with within the literature. I researched and wrote up a chapter on the organisation and administration of the Royal Air Force Medical Services, with specific emphases on neuropsychiatry and the core themes of specialisation and prevention. I completed a draft in late October and my supervisor, Professor Mark Harrison has given me very useful feedback. This was a mundane and tedious chapter to write but I had to do this first to be able to understand anything about my topic! The last few months have also been excellent. I entered my second year in October and I have begun to research a chapter on the development of aviation medicine, with particular reference to the study and understanding of mental disorder within the RFC, RNAS, and RAF until the outbreak of war in 1939. My research has taken me to Brooklands Museum in Surrey, where I met the most adorable volunteers, who helped me to understand the nature and consequences of flying accidents in the early twentieth century. I have set this within the context of the development of aviation as a whole, as I believe that the two chains of knowledge were developing at very different paces. I have also applied to present at a couple of conferences in 2013 and I am waiting for the results. I have also been granted access to three exclusive archives, which will add a unique qualitative edge to my thesis. These archives are virtually untapped by historians but I will not reveal their names and sources until I have been given ethical approval. I am a bit superstitious. I also joined the IHR HistoryLab Committee, based in London, and I am the Public Relations Officer for the Oxford Forum for Medical Humanities. We have an event coming up in the New Year - I will post details when everything is finalised. All in all, it has been an excellent year for me research-wise and I have made lots of new friends and contacts. I will leave you with this wonderful wintery photograph. This is held at the Imperial War Museum archives and is of three Westland Lysander Mark IIIAs of No. 307 Polish Fighter-Reconnaisance Squadron RAF. 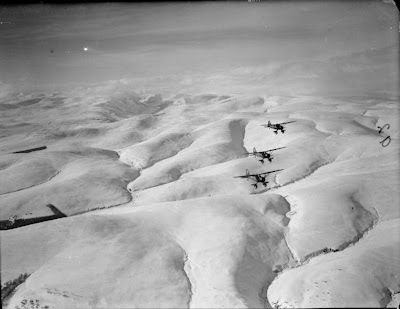 They were based at Dunino, Fife and this photo depicts a photographic reconnaissance training sortie in the snowy Scottish hills. I wish you all a very peaceful festive period, whatever you are doing and a Happy New Year when it comes. Let me begin this post by apologising for not updating sooner. I am back in Scotland for the festive period and my parents have presented me with a massive list of household chores. Some holiday eh? Secondly, thank you for continuing to read my blog. I have had 225 hits so far, which I did not expect! From the Second World War, the British public and historians have enjoyed a romantic relationship with the flyers of the Royal Air Force. This infatuation began in the summer of 1940, when British fighter pilots defended the country from the powerful German Luftwaffe in full sight of the villages of southern England. For the remaining years of the war, the nightly rumble of RAF bombers and the daily presence of dashing young men in blue uniforms added an exciting dimension to life on the austere home front. Enthusiasts and scholars remain captivated by the heroism and bravery of the airmen, which is indicated by, the recent construction of war memorials and the awarding of medals long after the Second World War. Historians, however, have yet to examine the full extent of the sacrifices made. The flyers of the RAF were considered gallant and heroic due to the dangers they faced in operational flying, but these men faced unparalleled psychological strains throughout the war and an organised team of mental specialists were essential in treating the emotional and neurological burdens of modern warfare. Each of the British armed forces employed a number of different tactics in the battle against mental disorder in twentieth century warfare. The most common was to employ a number of psychiatric and neurological specialists to diagnose, treat, and above all, prevent mental breakdown. This practice has received extensive attention from historians, who have produced a rich historiography that details the history of military psychiatry. The weight of scholarship, however, is completely imbalanced in favour of the army, which has led to the experiences of the RAF and Royal Navy being largely overlooked. This gap in knowledge is significant, as the RAF employed very specific mental specialists to manage the psychological effects of aerial warfare: neuropsychiatrists or as they were affectionately known, the 'trick cyclists'. My paper intends to assess the processes by which RAF neuropsychiatrists sought to prevent and treat mental disorder during the Second World War. I will describe the structure, administration, and organisation of neuropsychiatry in the RAF and will briefly outline the theories, methods, and disciplinary alliances that underpinned neuropsychiatry at this time. I will then move to examine the roles and duties of neuropsychiatrists in the areas of screening and selection, preventive policies, and the treatment of psychiatric casualties. As you can probably tell, this is definitely a work in progress and any comments/criticisms you have will be gratefully received. Also, if you have any tips for me to improve my confidence in academic public speaking, please let me know. This is a fear that I am going to have to overcome if I am ever going to become a good historian. I would like to begin this short blog post by thanking Dr Vanessa Heggie for her helpful comments on my previous post on the origins of military aviation medicine. She is a teaching associate at the University of Cambridge Department of History and Philosophy of Science, and has recently published a book on the history of sports medicine. I have taken her comments on board and this has helped me to amend the chapter I am writing on the development of military aviation medicine in the late nineteenth and early twentieth centuries. Vanessa's bio: http://www.hps.cam.ac.uk/people/heggie.html I have also had the pleasure of making the acquaintance of Roland Edwards, who worked with the RAF Institute of Aviation Medicine, and is now a PhD student at the University of Manchester, looking into the history of ergonomics. Thank you very much for your comments so far - I do take them seriously and aim to respond to each one. I have decided to do a bit of an institutional post this time, which is not exclusive to aviation medicine but features in a chapter on treatment in my thesis on RAF neuropsychiatry. Many temporary wartime/military hospitals have never been explored but contributed so much to our understanding of modern medicine. As I am located in Oxford, I thought I would look across Banbury Road to my nearest college neighbour, St Hugh's. I found a fact file relating to this college, written by Dorothy Quade during my preliminary research, detailing its wartime experiences and I thought I would share it with you all. 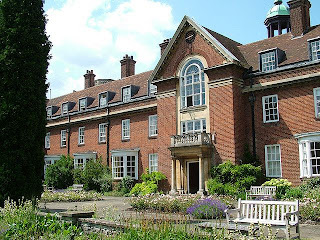 Not many people know that St Hugh's was requisitioned and it became a tri-service hospital specialising in head injuries during the Second World War. I discovered that one of the major RAF neurologists in my research, Sir Charles Symonds, based himself there unofficially throughout the war and this encouraged me to look into this hospital. The following is mainly descriptive and administrative but I thought I would share it with you. St Hugh's was an ideal site in which to establish a temporary hospital, as its buildings were relatively new, the oldest being built in 1915, which meant it was accessible and easy to keep clean. I don't know how many of you are acquainted with the design of traditional Oxford colleges, but they are built on a staircase system - rooms built off the main staircase with no connecting corridors, which would have posed logistical problems within a hospital environment. It was also located near RAF Brize Norton, which meant that cases could be evacuated by air and transferred to St Hugh's or one of the other Oxford hospitals. The armed forces built temporary brick huts to create wards, treatment rooms, and administrative accommodation within the college grounds. The hospital was in the capable hands of neurosurgeon Hugh Cairns, who believed that the sooner a head injury was treated, the more likely the patient was to live. The hospital sent out Mobile Neurosurgical Units, which performed operations on the injured at the front - the patients were then sent back to St Hugh's for further treatment. During the war, the mortality rate for head injuries had dropped from 50% in the Great War, to a mere 5% - showing how far techniques and developed, and was no doubt influenced by the use of the new wonder drug penicillin. 13,000 tri-service patients were treated at the 300 bed hospital throughout the war. This figure included not only allies but also prisoners of war. After the hostilities, some patients participated in on-going studies, which led to the development of new neurosurgical techniques. Little is known about the patients, as these records remain closed under the Data Protection Act. I hope you have found this mini post interesting and if you have come across St Hugh's Hospital in your own research, I would love to know what you found out.